Made of Cotton (68%), Spandex (25%) and Elastic (7%) and the Dare Color Sports Athletic Socks offer maximum fitness and better durability. Cushioned socks for that comfortable and secure fit. One-size fits all. These socks will fit sock sizes 8.5-12, designed to offer impeccable elasticity and adjustability. Designed to suit the needs of athletes and other sportsmen, the unisex-sized socks are lightweight, breathable They are suitable for unisex and will keep the feet dry and comfortable for longer. The Dare Color Sports Athletics Socks are easy to care for and are machine-washed warm or cold. The tumble dried socks come in a package of 6 athletic socks. Dare Color 6-Pack Low Cut Socks are terrific! I love that they are tight fitting and don't move around on my feet. Dare Color 6-Pack Low Cut Socks are perfect for running and keep my feet dry and comfy. I love their design and how lightweight they feel. I also love that they are unisex because originally these were for my husband but I loved them so much I often steal a pair to use when I go running or hit the gym. 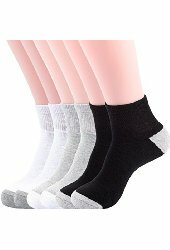 Dare Color 6-Pack Low Cut Socks are excellent socks and I highly recommend them!